We are in the Last Days. As such, God wants us to be in constant awareness of the affairs of the spirit realm, through our dreams and visions, so that we can effectively navigate this dark and obscure world and achieve a brighter tomorrow. Each and every day, God speaks to us through our dreams and visions to warn us, to guide us, to explain the past, and to decode the future. How many lives and destinies could have been saved, or how many marriages and relationships rescued, or businesses and careers secured, or ministries and callings preserved, if only our dreams and visions were understood and taken seriously? Pastor Uzor builds on his earlier and popular title, Dreams and Visions, by including in this latest edition a comprehensive and detailed list of commonly seen symbols in dreams and visions, as well as their interpretations. DISCOVER the Biblical basis for dreams, visions, and other types of revelations from God. GAIN some tips on how to navigate and interpret your dreams and visions. 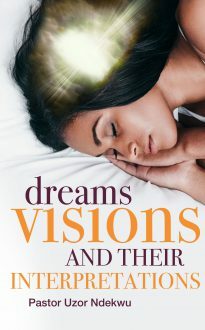 UNDERSTAND how to pray good dreams and visions into manifestation. UNDERSTAND how to reject and cancel negative dreams and nightmares. LEARN how to pray proactively with the included deliverance prayer points and take charge of your own destiny! banker, he is now Pastor of Jesus Sanctuary Ministries, based in Nigeria and the UK. He is married with three wonderful children.